Are you ready to begin your journey toward a Real Food Kitchen? I’ve broken down everything you need to know to get started, and put it into a simple, step-by-step eCourse to guide you along in the journey. ~ Baby stepping away from processed, boxed foods and toward delicious, healthy, fresh food. ~ Setting personalized goals that will work for you and your family – no matter your situation, location, or season in life. ~ Figuring out how you can make a Real Food lifestyle work for you financially. ~ Walking through the basics of simple, healthy menu planning. ~ Deciding when to compromise your real food diet. ~ Learning how to keep the journey simple and easy. ~ Enjoying balance and grace. Ahhhh...relax. Your Real Food Kitchen will be a breath of fresh air! ~ Eating foods that are all organic, grass fed, free range, fermented, raw, yada yada. All of these truly are great and healthy, and I will eventually offer a follow up eCourse that covers some of these ideas. But those are not the areas I believe should be our main focus as we take beginning steps toward a Real Food Kitchen. ~ Eating low fat, low carb, grain free, vegan, etc. I’m not knocking those ideas (necessarily), but within this eCourse, we’re working toward eating a wide variety of wholesome real food, in its original form, in balance. ~ Dieting. This isn’t about losing weight (although some might find that they naturally arrive at a healthy weight while working through this course). It’s about adopting and living a healthy lifestyle for yourself and your family. ~ Adapting to a one size fits all plan of action. No way. Your Real Food Kitchen is likely to look different from mine based on circumstances and preferences. This eCourse will allow you to create your Real Food Kitchen on your time table, around your schedule, and based on your own goals and desires. 1. Purchase the You Can Do This! The First Five Steps To a Real Food Kitchen eCourse by clicking on the “ADD TO CART” button. 2. Look for an email from me (Laura Coppinger @ Heavenly Homemakers) that should be sent to your inbox immediately after your purchase. The email contains all of the additional information you will need to gain access to the eCourse site and pages. 4. Follow the simple instructions in the email and get started whenever you are ready! Work at your own pace, any time of the day. I can’t wait for you to join me in this journey to healthy eating in your Real Food Kitchen! I’m curious if this is written in a format that would be engaging for kids. I’m going through a health curriculum with my first grader during homeschool time, but the nutrition information included is ridiculous! I’ve been just teaching him myself as a part of everyday life, but would love to have a more tangible program to go through as well. I would say that it would be engaging for upper elementary and beyond, but your first grader may have a difficult time getting as much out of it. Actually though, you could work through it yourself, and make your first grader a part of it as you set goals and make lists, etc. The videos are all 3 minutes or less, so while they are directed toward adults, a small child wouldn’t fall alseep from boredom since they are short. :) I think it’s worth a shot! I always love involving kids of all ages in the kitchen! Received the chicken recipe cards but didn’t get an email from you….. I just sent you another email with the info. Hopefully this one went through! Is there any way to order the program without going through paypal. I don’t have that account but would love to have this instructional guide. I purchased through paypal but there seems to only be a link for the recipe cards. Am I missing something obvious?? I’m so excited to start the course! I will need to snail mail you the check. What address? Thanks so much! I bought the course this morning, and I have already gone through the first few lessons, and made your chocolate chip pumpkin muffin recipe (they are delicious, and all 3 of my kids loved them). I am so excited to be on this real food journey. Thank you for all your help! Yay! Blessings on your journey! I ordered mine! I’m excited to do it! I just got the chicken cards a couple weeks ago when you gave us the $5 gift certificate…in fact, we had creamy chicken and rice tonight! :)Our Paypal account is through my husband’s work email. Is it ok for him to forward it to our home email? It’s just easier for me to have the info in that inbox than to have to get in his work email. Really enjoyed the first lesson. Thanks, Laura! i have been an avid follower of your blog for a few years now. i want to thank you for all that you share with us and for your extremely affordable prices. we are an active duty family, so we aren’t “loaded” by any means. real/whole foods is important to me, so when i find someone such as yourself who not only shares recipes, but offers them and classes at such great prices…it makes me very happy! I already have the chicken (and beef) recipe cards – I had ordered those a year or so ago. Any other options? Nevermind, I found it! Thanks so much. I got an email with what it says is a link to the lessons, but it just goes to the download for the recipe cards? Laura, I ordered this a few hours ago. I did not see the link to the recipe cards (although I could have missed it), and the email with the link to the eCourse has not come through. Am I being too impatient? How would I go about downloading the recipe cards? I’ve read great reviews on your product and am anxious to get it. 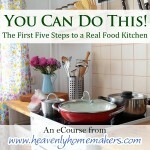 I just purchased the first five steps to a real food kitchen for $5.00 plus free bonus recipe cards. I have not received anything yet. I’m thinking they may have got sent to a bad email address. The one on my Paypal account is jbroady@bevcomm.net and is not current it has been changed to jbroady@ midco.net . Can you check on this? I really wanted to get started with real food! I couldn’t download the recipe cards. It said it wasn’t decoded or something like that. How long will this be available for, at the $5 price? I really want to get it but we are on a trip right now so I won’t be by a computer for a few days. I just want to make sure that it will still be available when I get back home. Thank you. I can’t wait to get it and start working through it. Well, I got bought it and was able to print out the recipes but I have not received that email yet. Thanks for the help. Is this ecourse available to affiliates? I purchased this eCourse a while back and still have the pass code. However, I can’t seem to find the page where I enter that code and could use some help. Also, the “click here” link above for the recipes cards isn’t working for me as well. I click on it, and nothing happens. Thanks for your help in advanced! If I ordered two copies of this course for my two newly-married nieces, how can I give it to them for a gift? Do I just forward the link I receive to them? Wouldn’t that link be associated with my email? Yes, you will just forward the email/link to them. It will work just fine this way!